For those of you who do not know, this summer we (Emilie and Lyza) will be traveling to the Philippines to research the environmental sustainability and economic feasibility of natural dyes. We are so excited to be starting the first 3 weeks of our fellowship in Manila, and eventually working our way to Bohol, where we will be for the remaining 5 weeks. While there, we will be posting collectively as well as individually about our experiences, challenges, and wandering thoughts. Continue following us here or at the links below, to hear more on itinerary, initial thoughts, and qualms about 13+ hour flights. 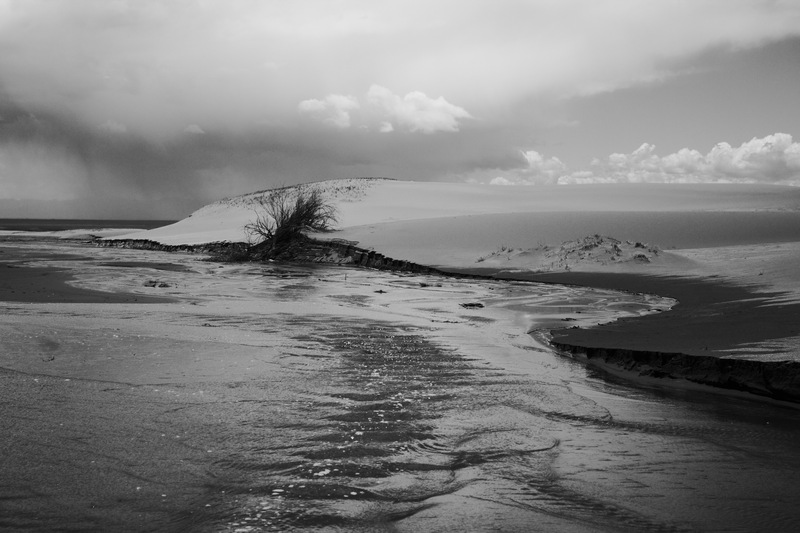 Going into my project at the Great Sand Dunes, I knew that there would be a lot of unknowns. I didn’t know exactly how welcoming the Ranger Staff would be, I wasn’t sure exactly how well some of my equipment would perform in the field, I wasn’t sure exactly how much support I would get, and I wasn’t sure how many of my skills would find a use out here in no-nonsense country. However, I was sure that I had a framework in place that would allow me to effectively problem solve immediately upon my arrival. The plan was that I was going to test my limits immediately and decide what the most sustainable course of action would be for me personally moving forward. I had planned on avoiding any costs for lodging by renewing a backcountry permit every day and setting up camp back into the nature preserve and I wanted to avoid imposing any cost to the park through my stay here. I had created a 3D scanning set up that would be portable, and so I attempted to pack in all my camping, scanning, and photographic equipment to see how I would do hiking the eight miles, round-trip to my site and back for the first few nights. I learned quickly that although this was doable, it certainly wasn’t sustainable, I couldn’t possibly pack enough food and water with all my equipment to be out for more than a day and expect to have enough calories to stay upright. In addition, most of the roads have been washed over, as the weather has been uncommonly unpredictable. Needless to say, much of my scanning equipment is sensitive to moisture and really doesn’t like the sand or surprise thunderstorms. Instead I decided that I could be more effective if I could find a permanent place to set up camp, and then make day trips to various locations to do any scans. I found that being ‘mobile’ doesn’t necessarily give me more range, but rather limits the amount of equipment I can bring with me. Conversely, being able to keep my living supplies in one space allows me to carry my equipment with me to a much wider range of locations. I also found doing any research to be next to impossible outside of keeping track of my own observations. So after a bit of asking around, I went to this campground right outside the park gates as I had heard that they were short-handed and talked the owner into taking me on for some hours on the weekends to work the cash register at her store in exchange for a patch of dirt to call my own. She kindly allowed me access to wi-fi as well as an employee discount on some basic supplies which has allowed me more consistent access to maps, and articles that have informed my movements through the park. It has also given me the opportunity to meet people who have lived for a long time and have given me tips on how places to go. My next hurdle was making contact with my internship supervisor at the park. After a productive first meeting we started to discuss many different ways in which the Park could utilize the technology I had brought with me, unfortunately he suddenly fell ill with pneumonia and was out for almost a week. So I had to find ways to structure my time to compensate for my lack of access to his colleagues, and some of the projects I had discussed with him, in some ways pursuing an evaluation of my own that would help me develop ideas that I could later pitch to the ranger staff that would involve interests of my own as well as interests related to the parks mission. In some ways I found that my hands were tied in some aspects because in many cases I found that I would need specialized permits to be able to access certain places in the parks, and in other places I would simply need for the creeks to drop slightly so that I might be able to pass through them. So I spent the week trying to see as much as I could, photographing as many different subjects as possible and scanning, whenever I could. Honestly though, there was a moment last week where I found myself feeling obsolete in a big way. I had been looking into some of the geological studies that the park has been conducting and found that in the last two years they performed whats called a LiDar scan of the Dune field which is basically a laser that costs more than my college education strapped to a Boeing Aircraft that flies over the entire park creating a super accurate model of entire park. My initial feeling was that I had just brought a butter-knife to a gunfight, literally every inch of the park had been essentially 3D scanned. Thankfully, upon further research found that I actually had a very relevant idea to suggest to the staff here as I found thatLiDar scans record X, Y, & Z coordinates in the form of point clouds in order to determine relative altitude in high-resolution which is what makes the images of aLiDar scan look like a 3D mesh when in fact it is not. 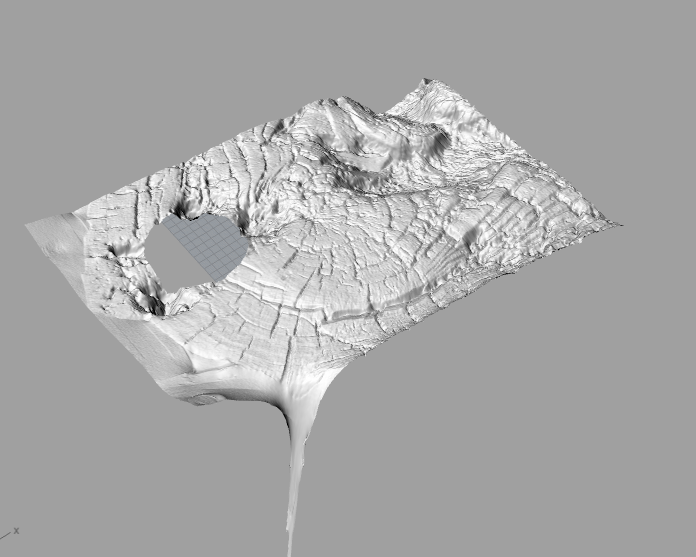 Basically I found that I can convert the standard USGS DEM file into a readable file for rhino and be able to (in theory) create a super high-resolution mesh model of the dune fields that would be capable of output. Thankfully I’ll have the opportunity to meet with their geologist to see how we could make it happen. What’s fascinating about the scan is that they have yet to have completed its evaluation, and they are still finding features on the dunes and surrounding Sangre De Cristo Range that hadn’t been identified before. It was only recently that they discovered a crater on the Northwest side of the park that they’ve just started to study. 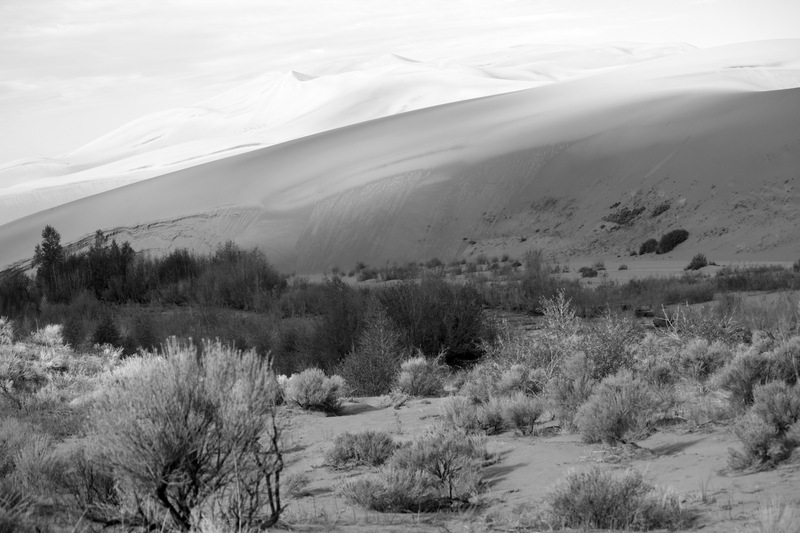 What’s also fascinating about the scan is that for a park like Great Sand Dunes it’s something that they might do every few decades to track the way that the sand shifts as unlike most parks, the topography of the park is constantly changing. 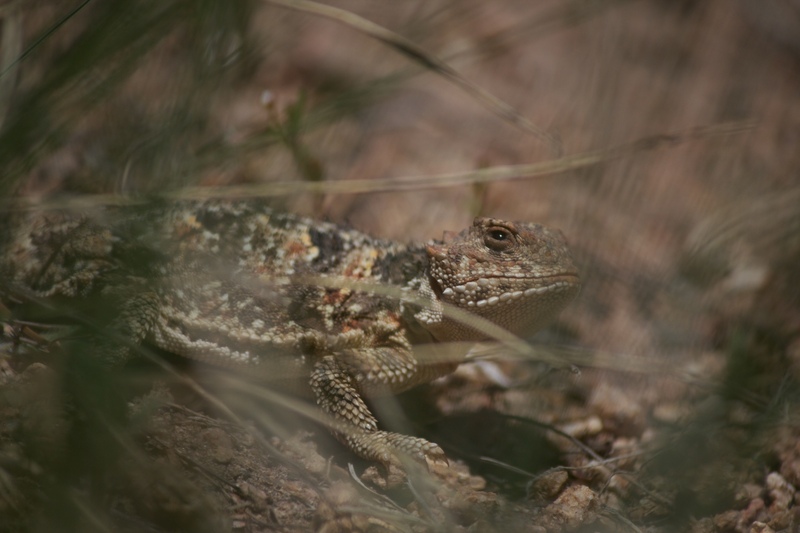 One ranger told me that one of the defining features of the park that can be overlooked by visitors is that, as the sand shifts, often times it reveals artifacts, and fossils revealing a fascinating history of life in the valley. The entire San Luis Valley was once wetlands, inhabited by Mammoths, Bison and early humans (among other things), so during an archeological survey conducted after Great Sand Dunes became a park, surveyors found mammoth bones, prehistoric bison fossils, fish fossils, and various artifacts from the Pueblo tribe. So as the sand shifts, more artifacts are revealed, often times simply falling out of the sand. As I continued my survey of the park, I drove out to the northern gate called Liberty Gate, named for the now Ghost town of liberty a few miles in from the gate.I read that it is usually only visited by people who come to ride their horses and I had a hunch I might be able to get some images of the large Elk Herds the roam the plains in the park due to the low volume of foot traffic (and well, regular traffic). Upon arriving I met an older gentleman from Kansas who had been hiking in from the North with his five Mules. He had come out for a while as his dog had been injured after having accidentally finding himself in the middle of a coyote den. You could very well tell that he’d spent a good amount of time on his own as I stood there talking with him for at least 2 hours. He’d been exploring the North side for a few weeks now and could tell me how high the creek crossings were (in his mind their was rated on a scale of one to “my boots got a little wet” while atop his largest mule) as well as where all the animals were. 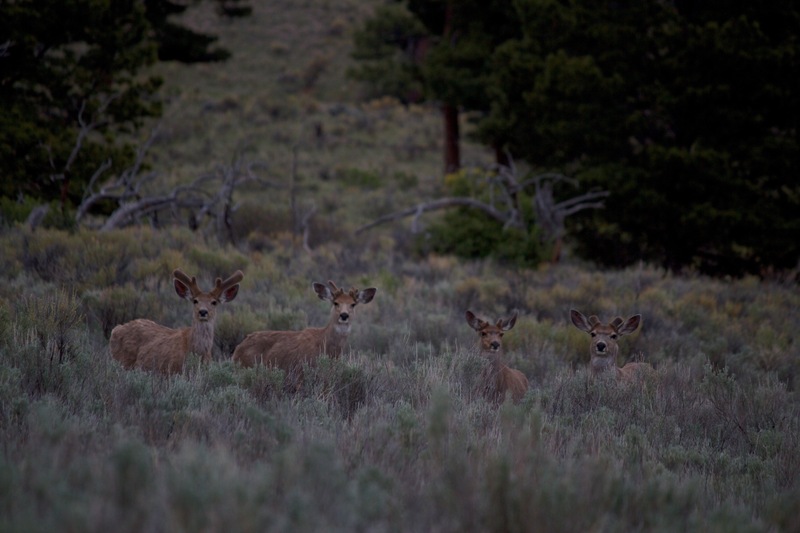 He told me the elk herds come down from the mountains at 5:00 AM, so if I wanted some pictures, I’d have to come early. He told me the Bighorn sheep were right near his campsite at about 10,500 feet, and that although a park ranger had said that he was full of it, he had in fact seen a Lynx in the park. Additionally, it seemed that he had an interest in abandoned mines, and that he’d found quite a few further in by looking for the quartz veins in the rock, that early gold miners would have looked for. After a long chat he seemed open to negotiating with me on perhaps helping me get some equipment through the northern side, something I’d be incredibly excited to do, as it would give me access to the aforementioned crater site. In any case, despite a few early logistical bumps in the road, the Park has begun to unravel in front of me; the history, the pre-history, the culture, the science, the beauty. All of these things have become clearer with every day that passes, and through that process my ability to contribute becomes more tangible. In many ways my supervisors absence has helped me structure my own investigation of the area, separate from their needs and interests, I think it will be valuable to maintain that balance as I continue to become more involved with the Rangers here. For me it has extremely exciting to feel a response of excitement, enthusiasm, and collaboration from the rangers I’ve spoken with so far over the past week and a half. I have high hopes for the coming days and weeks and feel confident that as my opportunities to contact park staff become more frequent my ability to see the park for everything it has to offer will become greater and will ultimately allow me to pursue solutions in the interest of the Park as well as in the interest of my own personal growth as an artist.